Are you encountering a common WordPress error on your site? Do you want to troubleshoot these WordPress errors on your own? Most of these errors can be solved by following easy troubleshooting steps. In this beginner’s guide, we will show you how to troubleshoot WordPress errors one step at a time. First thing you should do is to create a complete backup of your WordPress site. If you were already using a WordPress backup plugin, then make sure that you have a recent backup safely stored somewhere. If you were not using a backup plugin, then you should start using one immediately. However, in case you don’t have access to the admin area of your WordPress site, then you will need to manually backup your database and files. Backups allow you to restore your WordPress site easily when something goes wrong. They are your first and most important defence against security threats, hacking, and data loss. Most of the times errors are caused by a plugins conflicting with each other, your theme, or the WordPress core. Deactivating all WordPress plugins on your site will most likely solve the problem. You can then find out which plugin was causing the issue by activating plugins one by one on your site. If you have access to the admin area of your WordPress site, then simply head over to the plugins page. First you need to select all plugins, and then select ‘Deactivate’ from ‘Bulk Actions’ drop down menu. Click on the Apply button to deactivate all selected plugins. If you do not have access to the admin area, then you will need to use FTP or phpMyAdmin to deactivate all plugins. Simply connect to your website using an FTP client. If you haven’t used FTP before, then you may want to see our how to use FTP to upload files to WordPress. Navigate to the wp-content folder and rename plugins folder to “plugin.deactivate”. For more detailed instructions, see our article on how to deactivate all plugins when not able to access wp-admin. Sometimes your WordPress theme can cause issues on your site. 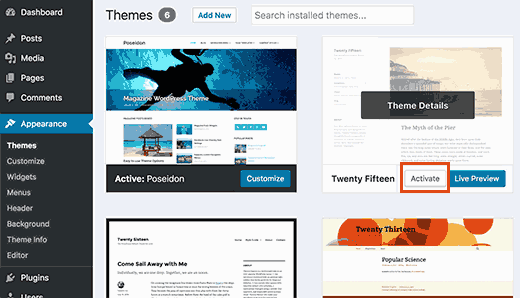 You can easily find out if your theme is causing an issue by switching to a default WordPress theme like Twenty Sixteen or Twenty Fifteen. Head over to Appearance » Themes page and then click on the Activate button next to a default theme. However, if you don’t have access to the admin area of your WordPress site, then you will need to use FTP to switch theme. Connect to your website using an FTP client and then navigate to /wp-content/themes/ folder. Download your current active theme as a backup to your Desktop. After that you need to delete all themes except a default WordPress theme like TwentySixteen. Since your active theme will no longer be available, WordPress will now automatically switch to using the default theme available. If your theme was causing the issue, then you should be able to log in to your WordPress site now. WordPress uses SEO friendly URL structure or Permalinks. Sometimes the permalink structure is not updated or configured properly, which may result in unexpected 404 errors on your site. You can easily refresh permalinks without changing anything on your WordPress site. Visit Settings » Permalinks page and click on ‘Save Changes’ button without changing anything. A corrupt .htaccess file is often the cause of the internal server error. First you need to connect to your website using an FTP client. The .htaccess file is located in your site’s root directory. You need to download the .htaccess file to your computer as a backup, and then delete it from your web server. You can now try to login to your WordPress site and go to Settings » Permalinks page. Click on the Save Changes button to refresh your permalinks and to regenerate a new .htaccess file for your site. Having incorrect settings for WordPress URL and Site URL options can also cause redirect issues, 404 errors, and some other common issues. WordPress URL and Site URL options can be changed from admin area by visiting Settings » General page. Make sure that both URLs are exactly the same. Once connected to your website using an FTP client, locate wp-config.php file. Now you need to edit this file in a text editor like Notepad. Don’t forget to replace example.com with your own domain name. Now save your changes and upload the file back to your server. You can also update URLs using your theme’s functions.php file. Open your FTP client and navigate to /wp-content/themes/ folder. Open your current active theme’s folder and locate functions.php file inside it. Now you will need to edit the functions.php file in a text editor like Notepad. Don’t forget to change WordPress URLs from the settings page after you login to your site. Once you have added them on the settings page, you need to delete these lines from your theme’s functions file. If your newly created WordPress site is not indexed by search engines, then this is the first thing that you should do. Login to your WordPress site and go to Settings » Reading page. Scroll down to the bottom of the page and make sure that the box next to ‘Search Engine Visibility’ is unchecked. This option allows you to discourage search engines from showing your website in search. It is used by webmasters when they are working on a website which is not ready to be live. Sometimes you can accidentally check this setting and forget about it. Make sure that this option is unchecked when your website is ready to go live. Many WordPress hosting providers do not have mail settings properly configured. This stops you and your users to receive emails from WordPress. If you are using a contact form plugin, then you will not be able to receive those emails as well. You will also not receive any WordPress notifications. See our complete step by step instructions in our article on how to fix WordPress not sending email issue. If you suspect that your WordPress site is affected with malware, then you should scan your website with Sucuri. It is the best website security monitoring service for WordPress site owners. See our case study of how Sucuri helped us block 450,000 WordPress attacks in 3 months. For more detailed instructions, see our guide on how to scan your WordPress site for potentially malicious code. 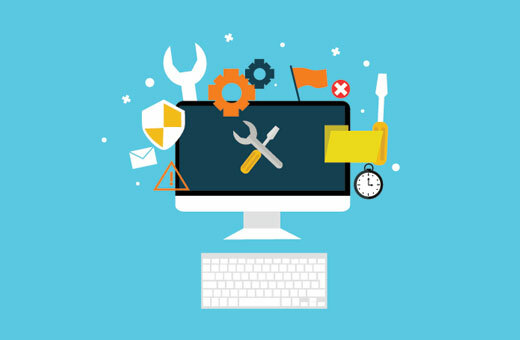 After following the above mentioned troubleshooting steps, you would be able to fix many of the most common WordPress errors. However, if the problem persists, then you can seek further support. Be polite and nice. No matter how upset or frustrated you are, do not use harsh language. Describe troubleshooting steps you have taken so far. Uplaod screenshots on a cloud image sharing service, and then add the links in your support thread. For more on this topic, take a look at our guide on how to properly ask for WordPress support and get it. 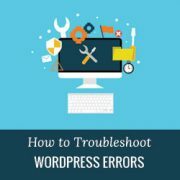 We hope this article helped you learn how to troubleshoot WordPress errors. You may also want to see our list of 14 most common WordPress errors and how to fix them. Hello, Thank you for this article. I’ve used WordPress often and never had an issue sharing my sites on Facebook. This week I picked up a project that another designer/developer gave up on. I noticed broken links had a long link that seems like a local host link. I changed those and made some other changes. The client went to post on Instagram and Facebook and the site says it doesn’t meet community standards, is there an easy solution to fix this? Plugin, FTP, Outsource service? It’s crucial for the site to be on Facebook and Instagram. I have uploaded up a wordpress theme from the wordpress.org themes. But when it is suppose to upload to my site, I got a message that there is nothing to be find. Could you please help? I am seeing the error every time I open my Install-Plugins.php or Theme Install page. I know this error is caused when Outbound port 80/443 is blocked for your hosting account. And it can be easily rectified from Cpanel and I even know that method. But the problem is I don’t have access to my Cpanel. I found a way to solve it through FTP by editing wp-config.php file and putting there a code. But it didn’t work out. I also resaved the settings of my WordPress but all my tries to solve that issue gone vain. I have also check my PC and it is not blocking anything. Can You please help me solve this issue? You don’t need to use Socializer to use BuddyPress or WordPress. You can safely remove it from your site. Fatal error: Uncaught exception ‘Exception’ with message ‘Illegal widget setting ID: nav_menu_item’ in /var/www/…. Thanks for the article – very helpful! Today, I started a wordpress account and began designing my first website. One of the first things that I did was upload an image to use for my header. I uploaded the file and WordPress gave me a single option: “crop image”. I set the crop borders and clicked “crop image.” It thought about it for 10 or so seconds and then presented the error: “unable to crop image.” The image does not violate my image file settings. This is pretty frustrating. Anybody have a solution? Please see our guide on how to fix image upload issues in WordPress. Sorry to hear about that. Please correct us if we are wrong, but we think you are using WordPress.com. Unfortunately, the best you can do in this case is to email their support team and explain them your situation. The troubleshooting tips mentioned above are for self hosted WordPress.org sites. Please see our guide on the difference between self hosted WordPress.org vs free WordPress.com blog. Great article. this was very helpful especially in regards to making some of these changes via FTP. Thanks! Is there any way to remove the side click bar in WordPress Classic called Streams- I have to use classic because my work computer has old IExplorer (8)- they are technological Neanderthals? It covers over admin links such as Media links? Hello sir, I have issues with my WordPress site in search console which says missing updated error and missing author error please guide me his to resolve it. When take a structure data test for pages on my website every thing results fine no error.